Vice Presidents: Messrs H.P. Zwar J.P, J.W.Holliday, J.E. Thomson, J.Sinclair, Cr. McFadyen. General & Social Committee: Messrs J.E. Thomson, J.W. Holliday, T.Sinclair, J.S. Hopkins, C.Whittig. Honorary Treasurer: Mr A.F. Deakin J.P.
What an active body of men and of vision they proved to be, for within a few weeks, through the generosity of Mr. H.P. Zwar, who loaned the club 75 pounds, they purchased the land in Murray Rd - where our clubrooms stand today. After devoting much of their time and labour, this same body of men finally took occupancy of the clubrooms in 1923. The club was then faced with a debt of 350 pounds which 200 pounds was a loan from the local branch of the United Ancient Order of Druids Society at an interest rate of 6 percent. With the acquisition of new members, the issue of 1 pound debentures, the holding of Euchre parties, socials and social efforts, the debt was finally paid out in 1930. Quite an achievement considering the times and that they still took part in club competitions, and stocking of local streams and lakes. Many who purchases debentures donated them back to the club. A ladies committee was formed and was instrumental in raising over 100 pounds for the building fund besides helping in many social functions. In the first year of the club, membership was 113, then slowly dropped until in the thirty's it was 65. It started to rise again until 1947 where it stood at 156 and had maintained approximately 160 or more to this day. In 1926 due to the untiring effort of Mr A.F. Deakin J.P. the club approached the Preston City Council with a request to install a trout hatchery at Edwardes Park Lake at Reservoir. After agreeing to finance the scheme for 50 pounds if the club would maintain the hatchery, the MMBW refused to install a pump so the scheme was dropped. Mr Deakin then installed and operated a hatchery in the rear of his home where a 97% success rate was obtained. In 1928 28,000 fry were released into Edwardes Park Lake, 1929 32,700, and in 1930 32,735, a remarkable achievement for a backyard hatchery. In 1931 the Preston Council with a working party from the club erected a hatchery at the lake and further good liberations were made. When Redfin were discovered in the lake it was decided to release yearlings instead of fry. Later owing to alterations to parklands and other causes, the liberations ceased. fish to 4 pounds were recorded as being caught in the lake in the years that followed. Many trips were organised to the Goulburn and tributaries to obtain Macquarie Perch to release in the Yarra River. Mr George Day was always on hand to transport these fish. During this period members fished interclub competitions and eventually won and kept the Hartley shield. In 1933 Mr D. McIntyre and Les Downey, with the assistance of other members, organised the junior club for boys from 12 to 16. The junior club flourished with juniors entering senior ranks at age 16. After 9 years, due to lack of transport and materials because of the war, the junior club was forced to disband in 1943. In September 1949, Mr. John Connell (Jack) as editor of his journal "The Optimist" had it typed for the very first time. It grew to an eight page printed journal some months later and six copies per club were mailed to nearly every angling club in Victoria as well as angling organisations in other states. We also sent copies to New Zealand and the United States. There were problems with publishers from time to time as it was getting expensive to print and they found it hard to make it pay. When Mr. Connell was very ill Mr J. Voice, Mr L. Downey and Mr C. McCann were determined "The Optimist" would not die.. We had to honour our financial obligations to our advertisers. Mr Downey took over as editor, Mr McCann looked after the accounts and Mr. Voice the advertisers. It was not easy, but with the help of donations from other clubs and our members we managed. Each month before one of the meetings club members wrapped "The Optimist" for postage to other clubs. Alex Whitaker handled the writing of the names and addresses. This journal was respected by clubs all over Victoria and overseas and Preston can be very proud of the reputation our club enjoyed because of it. Exactly twenty years later it was decided to cease publication due to rising costs and increasing financial losses. In September 1969 "The Optimist" as it was then ceased. Les Downey was editor, Ken Ely sub-editor and Cliff McCann our President. The spirit of "The Optimist" lived on and it was resurrected on a duplicator purchased by the club for use on annual reports and the syllabus etc. We have had help from editors over the years, those being Ken Ely, John Penrose and Les Penrose. At least four issues a year are currently printed mainly for distribution to our own club members. The costs were part borne by Frank O'Reilly's sports store over this period and in later years joined by Bob Ford. When John Voice retired as president in 1959, he had been elected unopposed for twenty years. Under his leadership the club membership grew as did its finances. John was a man's man, a strong leader and respected by all who knew him. The late Jack Connell's son-in-law Mr. Cliff McCann became president un-opposed after serving as treasurer for two years and social chairman for eight years. Cliff had the uncanny ability to involve those around him to perform at their highest level. Be it interclub cards, re-building our clubrooms or our lodge at Eildon, he was always a gentle and sincere man. During Cliff's thirteen years as President, our club saw many changes to our clubrooms (more on that later). We had a lodge at Eildon, two in fact because our first burnt down. Members worked very hard to maintain the Eildon Lodge which was considered to be the best of any of the clubs who also had lodges. Members such as Alan Russell would drive to Eildon on a Sunday morning just to cut the grass. We had vacated that lodge after many years due to the caravan park requiring the land for expansion. We purchased three boats for club use, two of which were bay boats and a punt for freshwater use. Through this, members gained experience and opportunity to have a boat on the bay and eventually the members built up a very good fleet of privately owned boats. Our library had it's beginning on the way home from Eucumbene in 1963 by Les Penrose, who decided that it was what we needed in the club to learn about those areas we are likely to fish in the future. It is now very up to date in 1997 and includes many good videos. In 1953 it was necessary to lay a new floor in the clubrooms, so volunteers went to work and whilst they were at it also put in a new plaster ceiling. About this time, a young group of budding anglers were starting to make their presence felt in the club. The left their mark - in the ceiling that is, and names like Russell, Penrose, Smart and Co. were discovered when further renovations were being done in 1978. During 1968 a new kitchen was being built with fifty percent more room, a refrigerator, updated gas stove and hot water service. A large servery and bench replaced the peep hole between the kitchen and hall. This was considered a big project at the time. During the next ten years much time was spent discussing an extension to the clubrooms and many sets of plans were presented to our club architect. While this was going on we were still putting up with the original outside tin toilets. Whilst attending a presentation night with the Healesville Angling Club, we were shown their new brick toilets. They kindly loaned us their plans and with some slight alterations the members and Preston council accepted them. The slab was poured in April 1973 and the toilets completed in 1974. 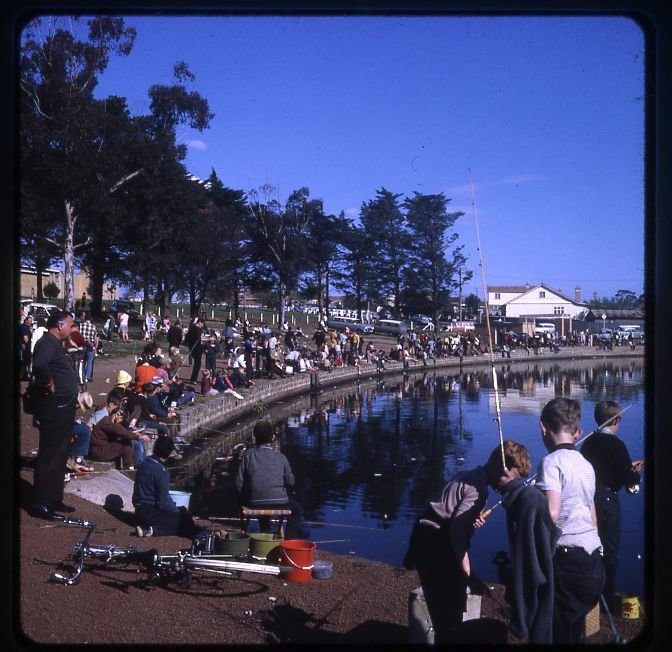 The club was thenkful for the services of the member Charlie Plane "The Drainer"
In 1972 the Preston Angling Club was holding the junior angling day at Edwardes Park on behalf of the Victorian Piscatorial Council with the assistance of some Melbourne clubs. Early on Sunday morning we received word that our President Cliff McCann had taken ill. While the junior day was an outstanding success for us, we also remembered it as the day Cliff retired as President due to his health. We had thirteen years with Cliff McCann as President and during this time he lifted our image to become one of the most respected angling clubs in Victoria. Bob Ford became our next President after he and Alan Russell were nominated to the position. Les Penrose remained as Secretary to help with the sudden change of President due to Cliff's retirement. We are pleased to say our club never took a step backwards due to the wealth of experience Cliff built up in his thirteen years. In 1983 a motion to have junior angling members in the club again was defeated. The following year after intense lobbying we once again admitted junior members to the Preston Angling Club. It took thirty-seven years, but we have finally honoured Les Downey's pledge to have juniors in the club again. One of our first juniors admitted, John Penrose has now been our treasurer for the last six years. All juniors who have become seniors are a credit to the club. There was to be no rest for our members for as hard as they worked to raise money for projects, they worked harder to complete those projects. Although we were not to know it then, the next ten years would prove to be the busiest and hardest in terms of work ever undertaken by our club. With a healthy bank balance once more, we set about working on the final stage of renovations to extend our hall to the rear lane and enclose our toilets as part of the main building. A new committee room, kitchen and a bar to go with our liquor license. In 1986 we engaged a builder to keep our voluntary labour on the right track. As our plans had fully been approved, work began in ernst. Foundations for the sides and back wall were dug by hand and a large slab poured over the total area. During construction we had many problems to deal with and we thank Alan Smith who eventually took over the builder's role and took the project through to completion. Tod Boots and Ken Ely handled the administration with Mal Simmonds, Perc Gravenall and Arthur Shoesmith Plastering, etc. A sum of money left to us by the late Tommy Tomic was wisely used to fit our modern kitchen. Those of our members who worked very hard on all stages of our hall, wether as tradesmen or labourers, you are congratulated for a magnificent job. We thank you. We had an official hall opening on June 18th 1988 in the form of a dinner dance and Mrs Molly McCann, wife of our late President Cliff, officially opened the hall. The Preston Angling Club became incorporated in October 1987. Our constitution brought in line with the rules of incorporation that allowed no room for error due to the cost of any subsequent changes. Our current constitution and rule book was first printed in 1991. One of the major changes to the club, a decision that shook us right down to our foundation members, rest their souls, was to admit women to our club as members. That honour went to Helen Warne. It must be noted however, that our roof did not fall in nor any male members resign, in fact nothing changed. We have three ladies on our current membership of 170 members. It is interesting to note we have quite a few junior girls who really enjoy their fishing. After some discussion prompted by Les Chadwick regarding some type of recognition for continuous service to the club, Alec Goodfellow and Arthur Nixon came up with the idea of striking a twenty five year and fifty year medallion in recognition of continuous years service. We thank Arthur Nixon and Alec Goodfellow for creating our solid silver twenty five year and nine carrot gold fifty year medallions. They were made as a badge or to be worn around the neck on a matching chain. The size of a ten cent coin, they have a beautiful fish over the letters P.A.C. "25" or "50". We have to date presented forty of the twenty five year medallions and four fifty year medallions. All members presented, wear them with pride and the twenty five year recipients look forward to getting their gold. We have a number of members coming up for their gold around the year 2000. Charlie Ely (now deceased) was our first to gain gold, followed by George Letchfors, Jack O'Loughlin and Ron Holliday (Ron now also deceased). In 1987, a meeting with the committee members of the Northcote Angling Club together with our committee, chaired by our President Bob Ford, resulted in Preston purchasing Northcote's Lodge building at Howqua. With Alan Smith in charge, members worked weekend after weekend, much of the time in shocking weather, to bring the building to a liveable condition so we could sleep in the building whilst on working bees. After re-blocking, we stripped the complete inside of the building and started from scratch. Alan had planned very early into the project just how the finished building was going to be. After excavating the rear of the lodge, a toilet block and shower with a covered concreted area between the new rear bedroom were added. A new three metre wide balcony was built down one side and two large concrete water tanks and a wood shed were put on the other side. The septic sewer, gravity fed water tank and Coonara wood heater were also added. Site works including our road and car park, an all weather road to the bottom gate and landscaping at the rear with barbecue built in, completed the picture. It is almost impossible to recognise the original building now. Thanks to Alan Smith for his work and foresight on the project, Ken Ely for his expertise and leadership, Barry LeFever, Dennis Hughes and Charlie Harrison builders, Perc Gravenal and Phil Treble painters and tilers, Gordon Mackenzie for helping us manage around the red tape and to Bob Ford and Les Penrose for their management of volunteers throughout the project. A special thanks to our plasterers who not only donated their time but also most of the plaster used in the building. A top effort considering they were not members of our club. We cannot name everyone here for we would have to name almost the entire club, but to our welders, mechanics, painters, builders, plumbers, electricians, cooks, brick layers, gardeners and workers, the Preston Angling Club thank you all. We still have at least three working bees a year for maintenance and members look forward to the social get together at the barbecue afterwards. A special thanks to our co-opted local care takers Mick and Judy Hogan. Not content with getting Howqua finished and having spent around $20,000 on the project, your executive examined the possibility of purchasing a property at Port Albert in 1002. A hall on a large block of land near the water seemed ideal for a salt water lodge. Your executive at the time recommended to the members of the Port Albert property at a cost of $40,000 was feasible. The members took up the challenge and many members made loans to the club to bridge the gap between the clubs available funds and the total cost. We thank those members and those that also donated their loans. Special thanks to Bob Ford, Tony Marino and Joe Perri for their involvement. Once again a building committee formed and work started. Fortunately the hall was in fair condition with repairs, painting, plumbing and electrical works needed, plus internal refurbishment. A hot water service and electrical wiring including a new switch board were put in place. A barbecue was built outside and other site works include a garage that will make future work easier due to the ability to store building materials was erected. Many home comforts including a television have been added to fill in time when the weather keeps the boats on land. With Les Chadwick organising the building committee we must thank Arthur Shoesmith, Rob Ward and Don Beeson. Thanks to the members and friends of members who have helped in some way to make Port Albert the wonderful asset it is to the Preston Angling Club. With the great satisfaction that by 1996 we had, through sheer hard work and dedication completely repaid our debt on Port Albert. Apart from the funds needed for on-going work, our fund raising efforts fully paid the $40,000. Our club members must be very proud to be involved in such a demanding project. After a record twenty years as our President presiding over the greatest growth period in the club's history, Bob Ford retired and Kevin Turner was elected our new President. We thank Bob for the sincere dedication he has shown over those years as President. No one has worked harder on the tasks undertaken by the club than Bob Ford. In the three years Kevin Turner has been our President we have had many new ideas from a different point of view and members are keenly participating in Port Albert competitions. Kevin introduced the concept of "fish capture records", which involves recognition for the heaviest fish of each species caught over the history of the club. Research going back to the beginning waas undertaken to find the heaviest of each species taken on club competitions. At our 1996 presentation night, members were presented with a framed certificate to acknowledge their record. Our weekly meetings regularly record an attendance of over seventy members. Working bees to both out lodges and our hall are well attended and special bus trips for surf, freshwater and picnics are always full. Presentation nights in the form of a dinner dance have always been well attended. Kevin introduced the President's perpetual trophy in 1995 - 96, which was presented to Les Penrose by Kevin for best clubman 1995 - 96. Some fine guest speakers, long range trips, tackle auctions and novel fundraising ideas are keeping members involved in the running of the club. Some very special achievements by club members over the years have seen life member Pat Lewton, past President of the Victorian Piscatorial Council and present President of the Metropolitan Anglers Association, be awarded the Order of Australia Medal for services to angling. Three of our members on their own undertaking organised the "Save Angling In Victoria" really to Parliament House in order to help raise the profile of Victorian angler's concerns. Thanks to Regan Carr, Tom Dislakis and John Penrose. Freshwater competition champions Leo Van Exel (11 times) and Dennis Hughes (8 times) and in saltwater Charlie Ely (11 times) have been our best so far. Andrew Brandi, our first to come from junior ranks to win a championship. He won the saltwater and surf-estuary champions in the 1996 -97 season. Angling changes ocer many years saw saltwater go from hire boats from places like St Leonards to having members private boats used in bay and Port Albert competitions. Freshwater's biggest change has been from buses (furniture vans) to private transport. With cars becoming available after the war years it was still a long time before the furniture vans were laid to rest. There were lots of reasons, including high costs, lack of comfort, road transport regulations and cars being able to tow boats as we moved into boats on freshwater trips. Whilst you cannot stop progress, most members would agree it tore the heart out of angling. We lost the togetherness, the fun being in the back of the van, playing cards, stops at the pubs, and the mateship that goes with travelling long distances in the same vehicle. For the older members the good old days will always remain the best part of their lives with the club. The championship points system also made a couple of changes, the first being a win 40 points, second 35 points, third 32 points, fourth 30 points then descending one point at a time after that. This replaced teh 40, 39, 38 37, etc system that prevailed before the change. This change resulted in a fairer system of reward for the participating anglers. Then instead of an aggregate of all trips on the syllabus deciding the champion, being the angler who had most total points, we changed that to the most points from a set number of trips. If there were twenty one freshwater trips for the season, it may eb the best eleven weigh-ins that count in deciding the champion. This is considered a superior system as it allows more anglers to have a chance as not everyone is able to attend every trip. This also allows for more of those anglers who are not single to win a championship. Saltwater, Estuary and Junior championships are also based on the same method. Our 75th anniversary dinner dance was combined with the 74th trophy presentation night on August 9th, 1997. The members made it a night to remember with special guests Mrs Molly McCann and Mr and Mrs Carl Kirkwood attending, whose associations with the club traced back many years. The venue was Oakville Receptions in High Street Preston where 160 members and partners were well catered for in fine style. Our members excelled in making this special night a part of our history. Now we can look forward to that night in 2022 - our 100th anniversary.